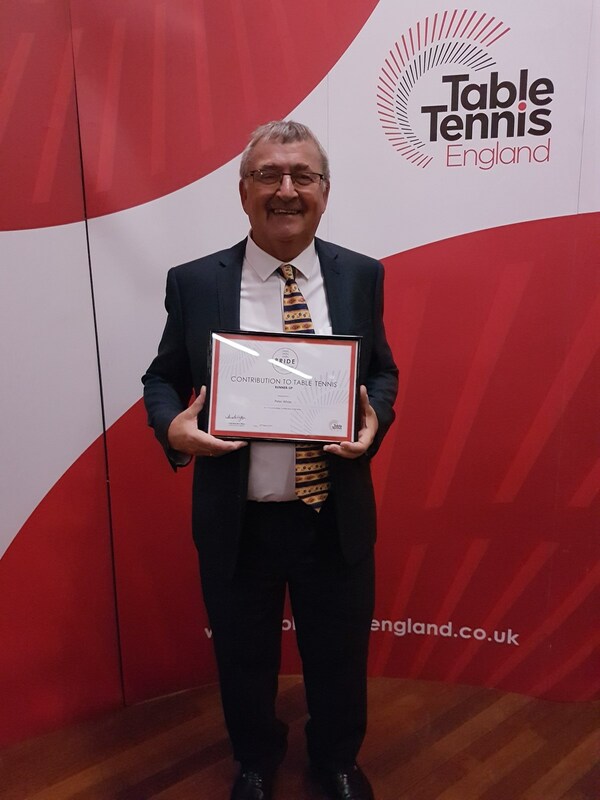 Peter White, Chairman of the Clacton and District Table Tennis League, has been honoured with a prestigious national award. At the 2019 'Pride of Table Tennis' Awards dinner held at Leicester on 30th March, Peter was runner-up in the 'Contribution to Table Tennis' section. The award to Peter was made by Sandra Deaton, Chair of Table Tennis England. The annual Table Tennis England awards honour the unsung heroes of our sport - the volunteers, officials, coaches and personalities who are the heartbeat of table tennis. Over 70 nominations were received. The citation which accompanied Peter's nomination is reproduced below. Peter joined the Clacton and District League in 1976 and played for thirty years. Although he 'retired' in 2006, he continues to be a key member of the League's Management Committee - he was first elected in 1978 so that's 40 years and counting! Prior to 1980, the League's Tournaments were organised collectively by the Committee. In 1980, Peter became the League's first-ever Tournament Officer, a post he held for 32 years until 2012. The League traditionally organised three one-day tournaments each season (Handicap Singles, Senior Combination and Junior Combination) with the Closed Championships held over two full days. His responsibilities were many and varied - arranging the venue, tables, equipment, trophies, refreshments, speaker system and umpires - plus sorting out unexpected problems on the day. Peter undertook these tasks with quiet efficiency, two words which sum up his approach and attitude. In 2000, Peter set up the League's first website 'from scratch' which included results, League tables, press reports and past League records. It quickly became a focus for the League's players. With the advent of TT365, Peter continues to be the League's webmaster. In 1988, Peter became the League's Vice-Chairman, a post he held for 26 years supporting long-time Chairman Brian Rowlen. When Brian died in 2014, Peter took over. Taking over from someone with such a distinguished table tennis pedigree as Brian was a difficult job but Peter has shown strength, commitment and dedication over the last four years, leading the Management Committee with quiet authority. As Chairman, Peter takes an interest in all aspects of the League (which currently has about 150 regular players). He's a member of the League's three Sub-Committees (Tournament, Development and Cup). Peter has always been closely involved with the Brotherhood Club where he spent most of his playing career. For many years, he was the club's Treasurer. As with the League, Brian Rowlen was the central figure at Brotherhood but, after Brian's death, Peter and another senior colleague have taken over the reins of running the Club. Peter had the honour and responsibility of being involved in the ETTA's National Top 12 Table Tennis Championships held in Clacton in January 1989. Peter was a member of the Management Committee for the event and took on the role of Assistant Tournament Organiser. The League recognised Peter's commitment in 1991 when he was awarded the Bob Phillips Trophy for services to the League. In 2012, he was made a League Vice-President. Peter was also recognised nationally, being awarded the Maurice Goldstein Merit Award (date unknown). In 2016, he secured first place in the Unsung Hero category in the Tendring District Council's Sports Personality awards . Whether as Tournament Officer, webmaster, Brotherhood Club stalwart, Vice-Chairman or Chairman, Peter has served the Clacton and District League for 40 years with loyalty and distinction. His calm, easy-going and non-confrontational approach has served him - and us - well.